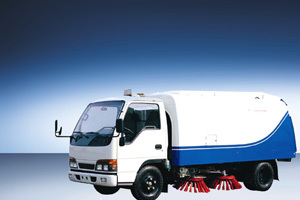 OLIVIER / Zoomlion Road Sweeper: The ZLJ5151TSL sewer integrated maintenance tanker is a new special vehicle developed which is mainly used in quickly and safely sewer suction, flushing and cleaning municipal sewers, channel, ditches and gutters and remove the sludge to a pick-up point. It is also widely used in oil refining, steel, chemical, housing, environmental sanitation industry for cleaning the waste pipe as well as the suction and transport and discharge of the waste water and deposit. It is a good guardsman of municipal engineering. “Two booms in the Center - - center brush recirculating air long nozzle structure” overall structure, improving the sweeping efficience, reducing the flying dusts, with original two grade dry dedusting system and air conveying airflow switching mechanism, ZLJ5151TSL could perform successfully either in cold weather or in rainy season.